Now it's even easier to create a house full of architectural moulding and casings—and plane lumber with this dual purpose machine. We have taken the proven design and features of our very popular G1037 planer/moulder and made it even better to produce the G1037Z. We moved the motor underneath for more convenient knife changes and added easily adjustable guides for use when moulding stock. 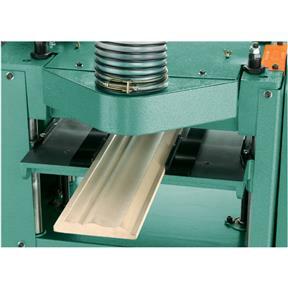 The 1-1/2 HP motor provides plenty of power for planing or moulding, and the included 4" dust port allows easy connection to a dust collector. Our low price, combined with its capability, makes this a machine that can pay for itself fast! Knife size: 13" x 5/8" x 1/8"
Approximate shipping weight: 236 lbs. Bought this to do moldings. It does a great job. Bought movable base also so it moves out of my way when not needed. I now have a smaller shop so floor space is at a premium. I think it was a good value also. 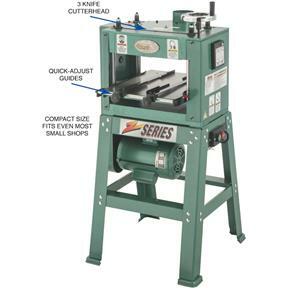 This is a great little planer/moulder for the home hobbyist woodworker. It planes pretty quickly, but really struggles if you try to take off more than 1/16" in one pass. Hooked up to a cyclone dust collector with large shop vac, and the machine's outfield roller kept getting jammed with chips if I ran two 6" pieces through at the same time. This would cause the boards to get stuck, and then you have to lower the table turn it off and vacuum it out and unclog it before you continue. Running multiple rooms worth of moldings was a little painstaking. This is probably due to my dust collection setup. This machine really demands a multiple horse power impeller dust collector. 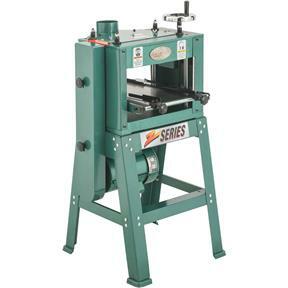 Nevertheless, it planes beautifully smooth, and with sharp molding knives, cuts profiles perfectly. The dual fences do a good job of keep everything lined up. Raising and lowering the table is speedy and smooth. The machine is very solidly built to last. It's extremely stable on the ground, even when shoving 16 foot pieces through it. planed some curly maple and ash boards. planed them smooth with very little snipe at end of boards.drum sander took care of snipe in one pass. have not used for making moulding yet.very good machine for the money. 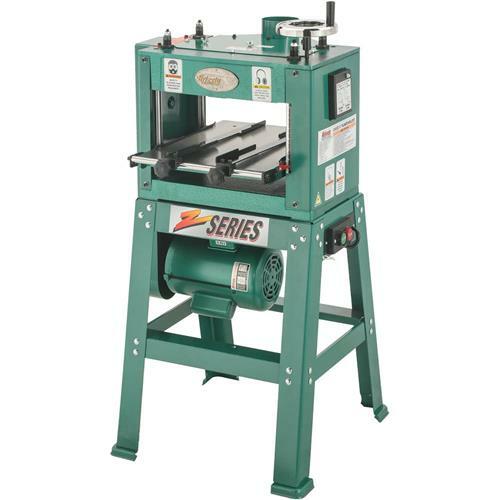 Love this machine, assembled it in a breeze this and the jointer I got are difeteley great adddictions to my little shop love them all ( have 9 grizzly's and adding soon ) waiting on edge belt on backorder now can't wait to see that. More machine than I really need but should not fail as my previous light duty thickness planer did. I have had this machine for a couple years now and I love it. I bought it at an auction for about $450, but it looked as though it had just come off the showroom floor. It has definitely held up well until about 6 month ago. The gears on the height adjustment seem to be binding up. I use silicone lubricant on the gears about monthly and this helps for about a month or so and then I have to do it again, which is understandable. They are gears, they need lubricant. I get that. But now the height adjustment is completely seized up. Lubricant isn't working. I thought I might post here before tearing this thing down to get some suggestions as to what my problem is. I was thinking maybe some surface rust somewhere or a wood chip in one of the gears. I do not look forward to tearing this thing down because it has so many parts and I am no mechanic, but I am at the point of what do I have to lose. Thank you. Love the machine, but miss my catalogues. Can you please send me a nice fat one? Havent used the moulder blades yet but am sure they are going to work as well as the planer, which is excellent. First project is almost done and it couldn't have done better. The mobil base unit I added gets it out of the workspace quickly and is solid. happy happy. This machine is built very solid. It does not vibrate around while in use. 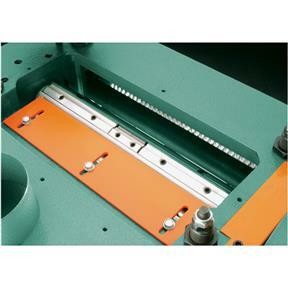 It performs like a larger planer. It produces a smooth uniform surface on hardwoods and softwoods alike. I have had this machine for a short period of time and have not produced any molding yet. Although, I plan on using it to make custom molding. 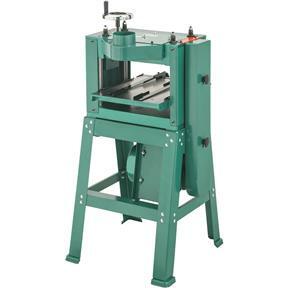 I am confident that it will produce quality moldings judging by it's performance as a planer. We so far really enjoy working with the planer/moulder. We have yet to figure out how to use the moulder. Make your wood 1" wider than the knife so the pressure rollers have enough area to feed the stock. I have had three of these machines. The first one was bought in 1999 and is still in uses today. The second in 2002, both of these were the older model with the motor on the top. The third was in 2007. I use them for moulding never for planning. I make custom siding, I run about 100000 to 125000 feet of siding a year. I replaced the 2002 model with the 2007 just because of the motor placement I added a 3hp motor. The 1999, having well over a million feet of material run thru it, will be replace some time next year. The gearbox is just wore out. I will replace it with a 1037Z, I will not consider any other brand or model. 2007 still running very well. This design in just bullet proof. 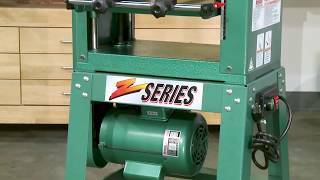 Do you use a mobile base on your mouder planer? If so, which one has worked well for you? What kind of outfeed and infeed tables / roller tables do you use? I'm considering this item: H6395 for that. I bought this planer about 6 months ago. It has a much better feel than any bench top i have used. I had the dewalt 735 and this just seems much better built, its heavier and has more power for sending rough sawn lumber through it. I have not used it as a molder yet but also liked that i will have that capacity when i get to the final stages of my renovation. I will use this machine to create every bit of woodwork throughout the house. I recently tried the other gear set to slow the feed rate down however. I was planing some air dried red oak that i milled with some figure, my knives arent to sharp anymore and i was getting alot of chipout. Swapping the gears took about a minute and no more tearout! You will not be disappointed if you buy this machine. No its not a 3 or 5hp machine but the motor does not overload and pop the breaker like my dewalt did every time i was trying to plane roughsawn.